Marcia Henry Liebenow, Concertmaster of the Peoria Symphony Orchestra, is professor of Violin, Viola, and Chamber Music at Bradley University in Illinois. She leads a multi-faceted career as a recitalist, chamber musician, and soloist. Marcia has appeared as soloist with the Samara Philharmonic Symphony in Russia, served as Primo Violino at Orvieto Musica in Italy, and performed in Germany, Ireland, and Wales. 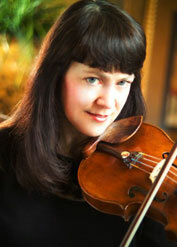 She is a founding member of the Concordia String Trio with violist Leslie Perna and cellist Karen Becker. The CST’s “Viennese String Trios” CD has just been released on the Centaur label. Her CD of Grieg Violin Sonatas with internationally acclaimed pianist Antonio Pompa-Baldi is also on Centaur. She is a member of Peoria Lunaire, a new music chamber ensemble, and the River City String Quartet. Marcia is a faculty artist at the Birch Creek Music Festival in Wisconsin, has presented violin master classes at the ARIA International Summer Academy, and performed at festivals in Vermont, Illinois, Pennsylvania, and Alaska. Her work has been recognized with the Outstanding Studio Teacher Award from Illinois ASTA, the Distinguished Alumni Award from Ohio University, and 25 Women in Leadership Award by the Peoria Chamber of Commerce. She earned her Graduate Diploma in Violin Performance from the New England Conservatory, studying with James Buswell, and her Master and Bachelor degrees with Highest Honors from Ohio University.